Green Meanies Video Slot Guide & Review - Casino Answers! 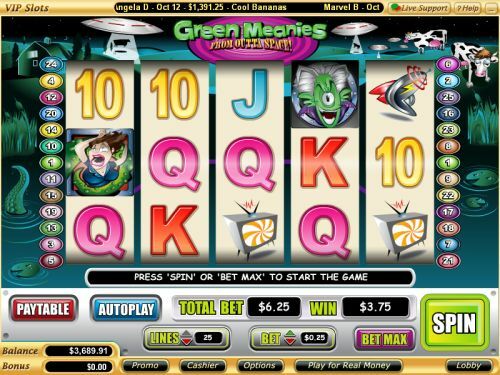 Green Meanies is a 5-reel, 25-line video slot developed by Vegas Technology, featuring a wild substitute symbol, scatter wins and a free spins feature. You can play the Green Meanies From Outta Space video slot at Bovada. 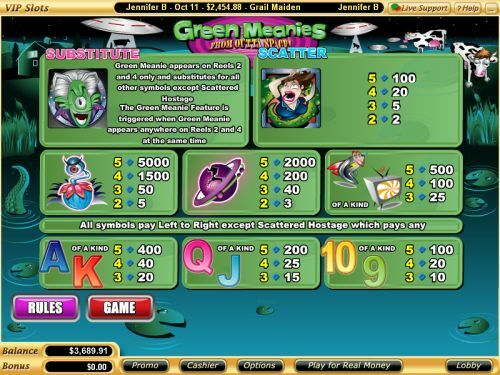 Bets on the Green Meanies slot machine are $0.01, $0.05, $0.25, $0.50, $1, $5 and $10 per line. You can select from 1-25 paylines on a spin in Green Meanies. You can bet as little as a penny per spin up to the maximum total bet of $250. The Green Meanies slot game has a very good betting range that will suit the most casual of players and the highest of high rollers. To play the Green Meanies video slot, select your bet and hit the “Spin” button or to play with all 25 lines enabled, you can press the “Bet Max” button to spin the reels. The highest paying symbol on the Green Meanies online slot game is the Alien Creature symbol. If 5 Alien Creature symbols land on an enabled payline, you will win the 5000 coin top jackpot. The second highest paying symbol is the Planet symbol, which can pay up to 2000 coins. You can win these jackpots by playing the Green Meanies From Outta Space video slot at Bovada. The scatter symbol on the Green Meanies video slot is the Hostage symbol. 2, 3, 4 or 5 Scattered Hostages anywhere on the reels will win you 2X, 5X, 20X or 100X your total bet. The wild symbol on Green Meanies is the Green Meanie symbol. It only appears on reels 2 and 4 and substitutes for all symbols except for the Scattered Hostage symbol. When the Green Meanie wild symbol appears on reels 2 and 4 at the same time, you will trigger the Green Meanie feature. The Green Meanie will become an expanding wild over reels 2 and 4, which will be held and the remaining reels will be re-spun 5 times. The re-spins are played at the lines and bet of the triggering spin. Re-spin wins are added to payline and scatter wins. Payouts are made according to the Paytable. Payline wins are multiplied by the bet per line. Scatter wins are multiplied by the total bet. Scatter wins are added to payline wins. All symbols pay left to right, except for the Scattered Hostage (which pays any). Highest win only on each selected payline. Coinciding wins on different paylines are added. Green Meanie appears on reels 2 and 4 and will substitute for all other symbols except for the Scattered Hostage. Hit “Autoplay” to open up the Green Meanies autoplay mode where you can select the number of spins (5, 10, 25, 50, 100, 250 or 500) and number of seconds between spins (0.25, 0.50, 1, 1.5 and 2). Stop settings are stop once all spins are complete, stop when jackpot is won, stop if a win exceeds or equals ($50, $100, $150, $200 or $250), stop on any win and stop if credits increase/decrease by ($50, $100, $150, $200 or $250). You can cancel autoplay on the Green Meanies slot game at any time. If you’re looking for a video slot with aliens from outer space, you will not be disappointed with the Green Meanies slot machine. It doesn’t have a bonus game, but it at least it has a re-spin feature and some good payouts as well. You can play the Green Meanies video slot when you sign up and make a deposit at Bovada. Where can USA players play the Green Meanies video slot for real money? American players are welcome to play the Green Meanies online slot game at any Vegas Tech online casino, including Bovada, if you’re looking for the best when it comes to Vegas Tech casinos. Can I play a Green Meanies Flash game for free? Green Meanies is not offered at the Instant Play casinos at Bovada, but you can find many other great video slots you might enjoy.